Coyotes are very adaptable creatures. These wild canines live in the mountains, plains, forests, deserts, and even the urban areas of the United States. When you come to Big Sky there's a good chance you'll spot a wild coyote. Keep your eyes on the lookout for coyotes wandering through the forests of Beehive Basin, leaping through the air as it hunts for mice in the Big Sky Meadow, or chasing deer in Yellowstone National Park. Or if you're lucky, you may hear a pack of coyotes making high pitched squeals once the sun sets behind Lone Mountain. The scientific name for coyote is canis latrans, which translates to "barking dog" in Latin. The name Coyote came from Mexican Spanish and was derived from the Nahuatl word for coyotl. Coyotes range from 32 to 37 inches long and 16 inches tall. Coyotes live 10 to 14 years in the wild. Their coats vary in color from gray to brown to red. Bears, cougars, wolves, and humans are the main predators of coyotes. A group of coyotes is called a pack. 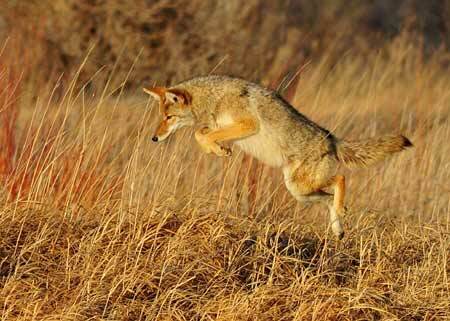 Coyotes are digitigrades, which means they walk on their toes. 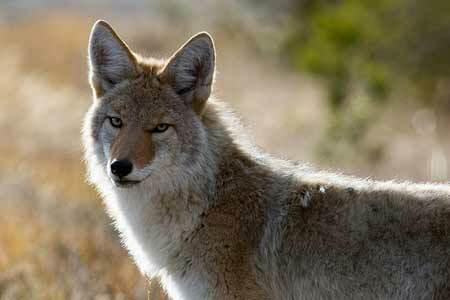 Coyotes are omnivores that eat rabbits, rodents, frogs, deer, antelopes, lizards, birds, plants, and carcasses. They hunt at night. They can run up to 40 MPH when chasing prey. 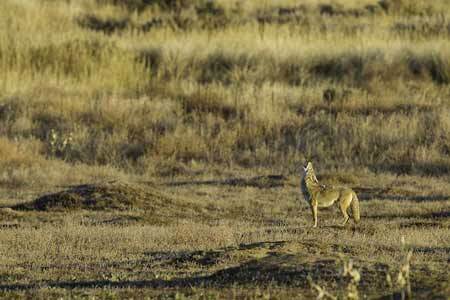 Coyotes are frequent communicators that growl, bark, wail, huff, yelp, squeal, and howl. Coyotes are territorial and mark their area with urine. Coyotes are monogamous animals - meaning they mate for life. Coyotes can breed with wolves or domestic dogs. They mate in February and gestation takes about 2 months. Coyotes have 5 to 7 pups. Both male and female coyotes care for the pups in their den. Pups don't open their eyes until 11 or 12 days after birth. Pups will hunt alone by six months. If you spot a coyote in Big Sky, give it plenty of space. They are wild animals and must be treated with respect. Be careful if you spot a coyote while you're walking your dog off leash or on the trail. It's always fun to spot wildlife in Big Sky. If you capture a photo of a wild coyote (or any animal) be sure to share it on social media with #visitbigsky.